Today we brought you an update on Kevin Everett and what he’s been up to now almost five years removed from his playing career with the Bills. He’s now a father of two girls with a third daughter on the way in December. 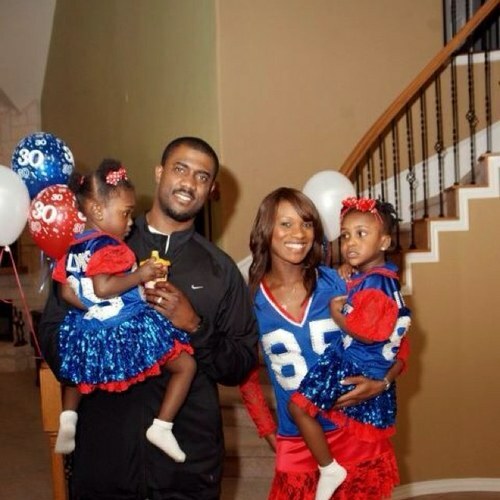 Here’s a photo of him with wife Wiande and daughters, Famatta (3) and Faith (2). Knowing a fair amount of Bills fans are always interested in how Kevin Everett is making out these days, now three years removed from his spinal cord injury, here’s a recent write up on the former Bills tight end. Everett was part of a spinal cord symposium in Austin, Texas. Some Bills fans have asked about former TE Kevin Everett and how he’s faring these days. A program called ‘Athlete 360’ is providing an update. It’s proven difficult for a lot of Time Warner Cable subscribers to find the program, but there is a way to see the entire episode containing Everett online. Just go to the listing on this page and click on the watch link for the Everett episode. The series is based out of the TIRR Memorial Hermann hospital in Houston where Everett was initially transferred after leaving Millard Fillmore Gates Circle hospital in Buffalo. There really isn’t a lot of new information as most of the program goes through the 2007 injury, but he does mention how he lives with pain every day throughout his body. He is still deciding what it is he wants to do with the rest of his life. Still I know a lot of Bills fans are interested in finding out what is new with Everett. So the episode delves a bit into his personal life. After missing all of Florida’s 2008 National Championship season due to an ACL injury last August TE Cornelius Ingram is eager to prove he’s healthy. When I asked him how he can use this workout forum to prove he’s back, he had a quick quip. Ingram said he will work out, but didn’t confirm that he would do everything on Saturday when tight ends are up. “I feel great, I’ve been cleared and I’m pretty much thinking about doing everything here at the combine,” said Ingram. If Ingram can post a good 40-time that’s close to his times which are usually in the mid to high 4.6s he’ll solidify himself as a 3rd round pick. Ironically some scouts compare his athletic ability to that of former Bills TE Kevin Everett.